When we think about environmental policy and regulation in the U.S., our attention invariably falls on the federal level and, more specifically, the U.S. Environmental Protection Agency. Although such a focus is understandable, it neglects the actors most responsible for the implementation and maintenance of the nation's environmental laws - the states. Recognition of the importance of the states still ignores an even smaller subsection of actors, inspectors. These front-line actors in state environmental agencies are the individuals responsible for writing environmental rules and ensuring compliance with those rules. They play an important role in the environmental regulatory state. With data collected from more than 1,200 inspectors across 17 states, Michelle C. Pautz and Sara R. Rinfret take a closer look at these neglected actors to better understand how environmental regulators perceive the regulated community and how they characterize their interactions with them. In doing so, they explore the role these front-line actors play, what it is like to be them, what they think of their place in the environmental regulatory system, and how they interact with the regulated community. 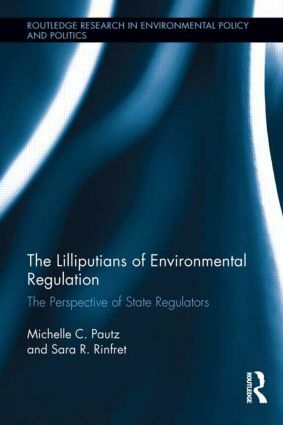 An original, timely and unmatched volume advancing the debate on the future of environmental regulation in the U.S.
"In this extensively researched and engaging book, Pautz and Rinfret dispel a number of myths about the frontlines of state-level environmental regulation in the United States. The findings underscore the potential for and value of a partnership between regulators and regulatees in bringing about compliance. The book should be read by those who are concerned with improving the implementation of environmental regulations." "Environmental regulation today is widely criticized for many alleged failings without much understanding of how the system of federal and state policy implementation actually works, and whether proposed alternatives to regulation would do any better. This unique volume contributes significantly to our understanding of environmental policy by offering extensive new data on and many new insights into a critical but neglected component of the regulatory system—the work of front-line professionals at state agencies, the Lilliputians, whose daily and often positive interaction with the targets of regulation is critical to its success." Michelle C. Pautz is an assistant professor of political science at the University of Dayton where she teaches undergraduate and graduate courses in public administration, environmental policy, and public policy. Her work has been published in Administration & Society, Administrative Theory & Praxis, Journal of Environmental Studies & Sciences, Policy Studies Journal, PS: Political Science & Politics, and Review of Policy Research, among others. Sara R. Rinfret is an assistant professor of political science at Hartwick College. She teaches undergraduate courses in regulatory policy, public policy, public administration, and environmental policy. Her work has been published in Society and Natural Resources, Environmental Politics, Review of Policy Research, PS: Political Science & Politics, Oxford Handbook of U.S. Environmental Policy, and Human Dimensions of Wildlife, among others.